we desperately needed to make another batch of homemade playdough as our brown-mud playdough and our pink strawberry playdough had seen their last days. 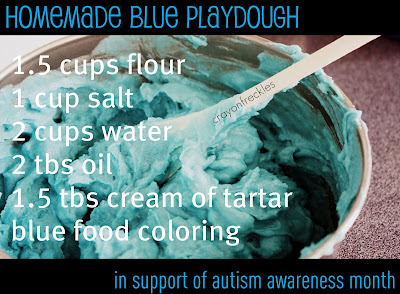 since it's Austism Awareness Month, we made blue playdough. Bear wanted to do it all by himself. so i let him do as much as he could alone. Bear crossed the ingredients off as we added them. and yes, the dumptruck acted as a measuring tool. Bear was able to decide how much blue to add. then he mixed it all up! here's the recipe we used in a cute little, pinnable image just for you! we've used this recipe from the Nurture Store since we saw it in their playdough cupcake post. they also have a free playdough ebook available here. 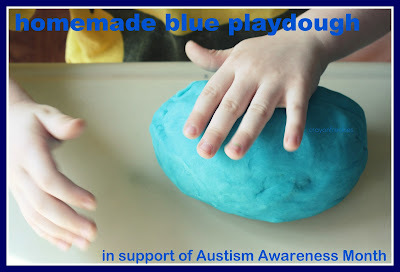 Love the blue playdough for autism. We use a very similar recipe, it has a little less salt though. What an awesome idea! You are so creative. What a lovely shade of blue. Thanks for sharing at Sharing Saturday! !